Don Peterson (far right) and friends enjoy a few rounds of pickleball in the Pine City Elementary multipurpose room on April 8. 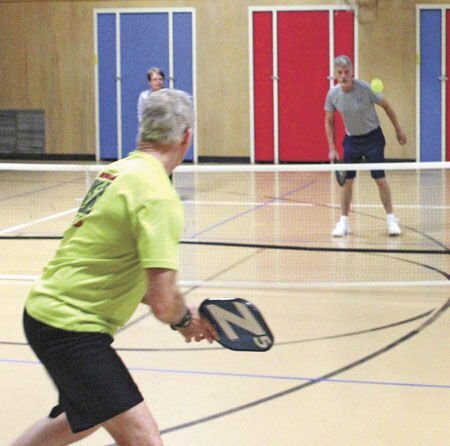 Pickleball is a fast-moving sport, but is designed for athletes of all ages. When Don Peterson tried pickleball for the first time, he felt right at home. Pickleball has been described as a combination between badminton, ping pong and tennis. The paddles are solid and about twice the side of a ping pong paddle. The ball is about the size of a baseball, hollow, and made of a flexible plastic with whiffleball-type holes in it. Most importantly, the net is only 34 inches high in the middle, and it is played on a small court about a quarter the size of a tennis court. Since the game is usually played with doubles, each player stays within a space just a few feet wide. This makes the game active, but not as physically demanding as tennis. “You don’t have the real estate to cover,” Peterson said. After he discovered the sport, Peterson brought it back to Pine City and got his friends and neighbors involved. Peterson said there is a lot to enjoy about the sport. 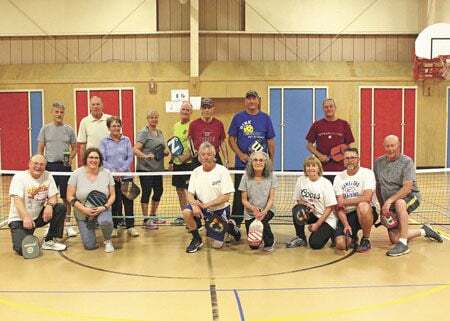 Pickleball is currently played Tuesdays and Thursdays at the Pine City Armory from 9 a.m. to noon and Friday night from 7-10 p.m. at the multipurpose room at Pine City Elementary School. And for beginners to the sport, organizers are adding an 8-10 p.m. session on Wednesday nights at the Pine City Elementary School multipurpose room. For more information on pickleball in Pine City, contact Don Peterson at 320-629-6969 or Joe Zeleny at 320-390-0786.